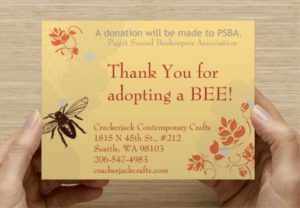 We received this invitation from Shirley at Crackerjack Contemporary Crafts in Wallingford and thought you’d like to know about it since it is a chance to benefit PSBA with your purchases of bee related products in their store this Saturday. Thank you to Crackerjack Contemporary Crafts! Throughout the month of April, we are focusing on bees, and how their numbers are declining. These harbingers of spring and the essence of a lazy summer day, are in jeopardy, and we thought we’d like to help! For every purchase of select “Bee related” products in the store, we will make a donation to the Puget Sound Beekeepers Association, and you will have Adopted a Bee! Choose to buy a felted bee for your sofa, a bee bar hand lotion, beeswax candles, or any of a number of “bee things”! Come see first-hand the benefits of beeswax to your skin on our Adopt a Bee Spa Event Day, Saturday April 18th from 12pm – 4pm. Enjoy a soothing, luxurious spa treatment for the hands employing some of our favorite skin care treats and all with a little help from the bees.